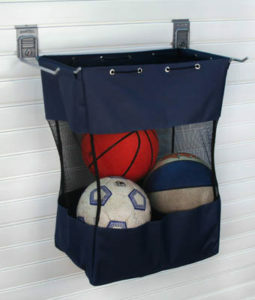 Store and organize lots of big items and sporting equipment on the StoreWall Grab Bag – Large. Stores everything your imagination can think of – in the garage, kids’ rooms, pantry, and laundry. This is the largest of the Grab Bags. Check out the Small Grab and Go Bags and the Medium Grab and Go Bags. Made of heavy duty tear-resistant canvas with Mesh Panels for circulation and visibility. 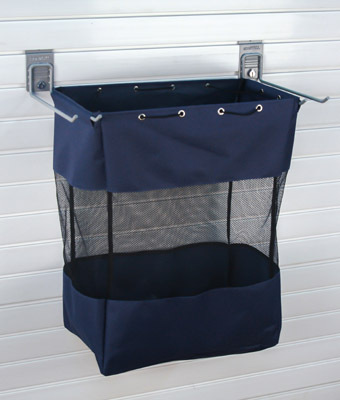 Fits on the 12-inch long Universal Hooks (included) and attaches to StoreWall Panels or standard 3 inch on center slatwall panels in which the slot goes straight in and straight up.